As much time as I’ve spent in the FIT Studio since it opened in 2014, I’d avoided wandering all the way back to the Live Action Studio for fear that I was far from qualified to enter its soundproofed walls. Then this past fall, circumstances compelled me to overcome my reluctance and take on a project that would make use of FIT’s Video Recording and Production services. As it turned out, no expertise on my part was required. All I needed was a vision of what I wanted the project to accomplish. The crack FIT team enabled me to turn that vision into reality. The project that emerged from this venture focused on students who are taking part in one of our new Living-Learning Communities at CI. The Student Undergraduate Research Fellows (SURF) live together and take courses together throughout the year. Students also engage in a variety of co-curricular activities, the most ambitious of which has been a weekend Thinking and Writing Retreat with faculty and students at CI’s Santa Rosa Island Research Station this past October. As the writing instructor for these students, I was interested in capturing in video what they anticipated from the trip before we left as well as their reflections afterwards on what they actually experienced. I emailed students to let them know we’d be wandering over to the FIT Studio during our class meeting prior to the trip and shared in advance the questions they’d be asked. On the day of the students “close up,” one of the FIT Studio’s talented student assistants, Ben Hytrek, welcomed everyone and expertly guided us through the process. In less than an hour, 17 students had been interviewed on camera regarding what they expected to get out of our visit to Santa Rosa Island. Ben uploaded the footage to Dropbox later that day for me to review. After an incredible weekend on Santa Rosa Island, we engaged in a similar process for the post-trip interviews. Students had plenty to share regarding what their visit to the island had taught them about themselves as writers, thinkers, and potential researchers. Questions were a bit more complex and answers were lengthier than in our pre-trip interviews, but it still only took about an hour to amass the words and thoughts of 17 students. Ben uploaded this footage to Dropbox as well and prompted me to consider the shape the final product would take. As adept as Ben Hytrek was during the filming process, he really shined in the editing booth. Left to my own devices, I would have cobbled together the videos in the most rudimentary fashion. Under Ben’s steady hand with Final Cut Pro, raw footage became a series of six tightly focused videos that captured the authentic voices and experiences of first year college students. Watching the completed videos, which are all posted on this page I created via Populr, it is hard to imagine why I was so hesitant to venture into the Live Action Studio. There is nothing like seeing actual CI students on camera and listening to them speak for themselves. I shudder to think about the opportunity that would have been missed and voices that would have gone unheard if I’d continued to remain intimidated by those soundproofed walls. 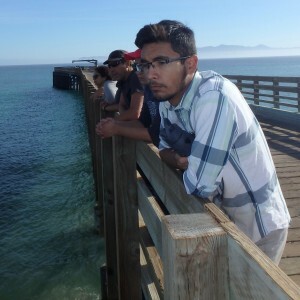 Student Undergraduate Research Fellows on the Santa Rosa Island Pier.